A firsthand account from a photographer who traveled with the migrant caravan for weeks. 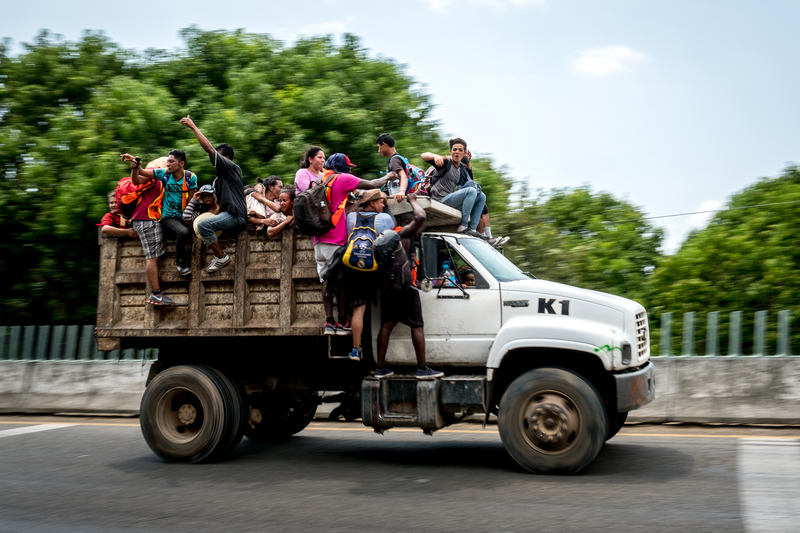 BuzzFeed News sent photographer Luc Forsyth to cover the huge caravan of Central Americans traveling to the United States this spring. Forsyth and reporter Adolfo Flores accompanied the group from the southern border of Mexico and Honduras to Tijuana over the course of 32 days. We spoke with Forsyth about his experience in an interview that has been condensed and edited for clarity. The whole assignment ended up being much different from what any of us expected. Initially, we thought we were going to be hiking with a small group of maybe 20–30, but when we got there we realized it was massive — more than 1,000 people. Our original plan to focus on one or two individuals was jettisoned once we understood it was potentially the biggest caravan in history. Very quickly we fell into the daily rhythm of the caravan and after weeks we almost felt like we were part of it. The caravan returns to the march after resting under some trees outside Huixtla, Chiapas. 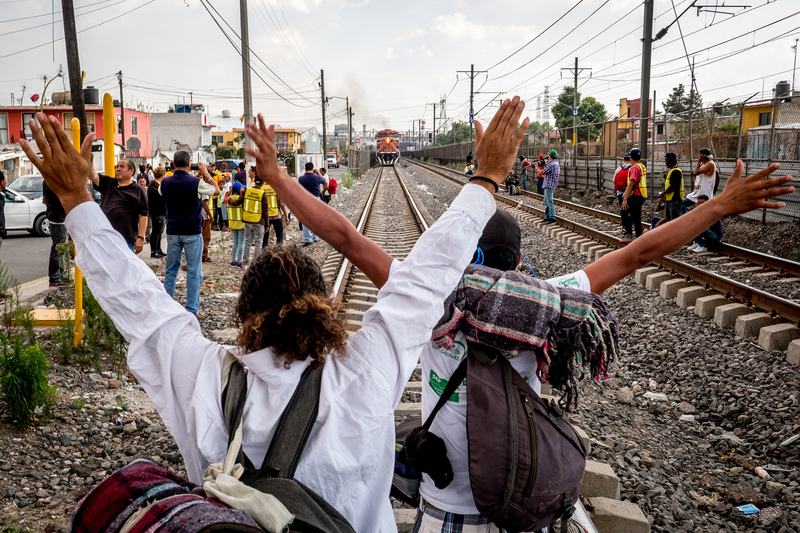 Two men stand in front of an oncoming train in Tultitlán, Mexico State, hoping to cause it to stop so the caravan can board. In a lot of ways, it was a dream job, engaging and interesting. But it also drove us crazy because many days were just like the previous one. Sometimes the caravan would stop making progress, and no one would be doing anything for days and days. So you have this element of excitement combined with an element of boredom, and we didn’t know when it would finish. Whatever this was like for us, I can’t begin to imagine the uncertainty that the actual migrants had. I knew I was just going back to my apartment, whereas they were maybe going to get deported to extremely violent countries or perhaps spend two years in detention. They had no idea what was coming, and it must have been terrible. They couldn’t do much but endlessly speculate about what was going to happen, but there was never any way of knowing. It was like a traveling purgatory. None of these people had any illusions about what was waiting for them, either. Despite what certain politicians might say, they certainly didn’t think that they were going to get DREAMer status or would be welcome in any way. They knew the US didn’t want them, but given the choice of being unwelcome or having your whole family murdered, they obviously had to try. A Honduran man shows a bullet wound he sustained in his home country. For you, as a journalist, what were the main challenges? I know other reporters who have gone on this route with smaller groups and had their lives threatened by hostile villagers and gangs, but with a group this size, we didn’t experience much of that. The idea of this caravan was safety in numbers, and it worked. Technically speaking, bad lighting was a constant problem as it was all outside and we obviously couldn’t wait until sunset to shoot. I found that a lot of the most intimate and personal moments happened at night, but that presented different challenges as people were sleeping outside and there was very little light. On top of this, coping with data management and batteries was a nightmare as I had to carry all my equipment on my back. Normally, I leave most gear in a hotel when I work — but since we moved every day this wasn’t an option, and as a result I had much less gear than I might have liked. Since modern digital cameras are very power-hungry, I was constantly short on batteries. The only way to recharge was to rent really cheap rooms as close to the caravan as possible and constantly run back and forth plugging things in. I was just charging batteries constantly — anytime we saw electricity I would be charging. The caravan stops for a break under the shade of an overpass outside Santiago Niltepec, Oaxaca. Can you talk a bit about the day to day? I was expecting people to be a little more prepared for a long trip. I didn’t think they would have high-tech gear or anything, but lots of people didn't even have bottles of water — and it's Mexico; it’s hot. People showed up with plastic shopping bags with a couple of T-shirts and started walking. It wasn’t their fault — many of them had to flee in the middle of the night — but it was shocking how little some of them had for a cross-country trip. The daily routine was to walk as much as people could handle and then line up along the side of the highway and hope for rides. Whoever had money would pay locals with cars, and the people who didn't have money would sit there until a truck came by that would let them hitch a ride. By the third or fourth day, people were already so tired that they just walked to the edge of town and started hitchhiking. A couple of times the organizers had to get people up and moving, because they would just sit down and wait. They were lulled into a false sense of security, like I was, because of the size of the group. Having 1,200 to 1,500 people walking down the side of the highway is just impractical — you had to go at the pace of the slowest person. They would put older people and women with kids up at the front to make sure that people couldn't walk faster than that, so it was essentially like a parade. Migrants cheer after successfully hitching a ride in the back of a dump truck outside Huixtla, Chiapas. They were holding signs, they had chants, and those chants went all the way up to Tijuana — the same chants over and over again. The banners were also a way to keep everyone walking at the same speed and to stop people from spilling out over the whole highway. There were also some surreal situations. There was an 80-year-old woman in a wheelchair who really did not want to be on the caravan. Her grandson had brought her and was telling her, “You're coming with me, because I can’t leave you behind.” There was no one to look after her in Guatemala, where they’d come from — it was an impossible situation. She was completely exhausted and constantly begging to be left behind, which, of course, was not an option. It was like a traveling village. You can see the pictures of people sleeping — how closely packed they were, how tough they were, and also trusting. They had to set up a camp for their family in a public park and had to sleep next to people that they barely knew. They were vulnerable — in a country where they have no connections, foreigners in a country that has a record of treating migrants very badly. We would walk for four hours and then everyone would sit down for four or five hours and then get picked up by vehicles piecemeal. People were wearing flip-flops and super-cheap dress shoes. They were just weren’t prepared at all for a big hike and the organizers saw that. A couple of times the organizers had to get people up and moving because they would just sit down and rest and then someone would come along and be like, We can't stop here. Migrants sleep in a public park in Arriaga, Chiapas. Can you describe a particularly memorable moment? I don't know if it was the most important moment story-wise, but for Adolfo and me, waiting for the train was very intense. The train, commonly called “La Bestia,” is notoriously dangerous. Not only is it physically risky, since you’re riding on top, but it's also a target for cartels, kidnappers, and robbers. To protect themselves, people were scavenging pieces of metal from a nearby construction site. We were asking ourselves if we should also arm ourselves or not. This was the only time in the whole caravan when I was actually scared for my life. We were two journalists thinking about the possibility of having to hit someone with a piece of metal as they climbed up to kidnap or kill us — that’s not a choice I normally have to make while working. We watched the migrants arming themselves and thought, These guys will fight to the death if something goes wrong, and I don’t know if I could do the same. We really had to think about our roles as journalists. We did end up bringing along pieces of rebar because if something really bad happened, we didn’t think it was fair to expect the migrants to protect us if we were not prepared to protect ourselves. I actually kept my piece, and it’s now hanging on the wall of my place in Mexico City to remind me that journalistic ethics are more complicated in reality than in theory. 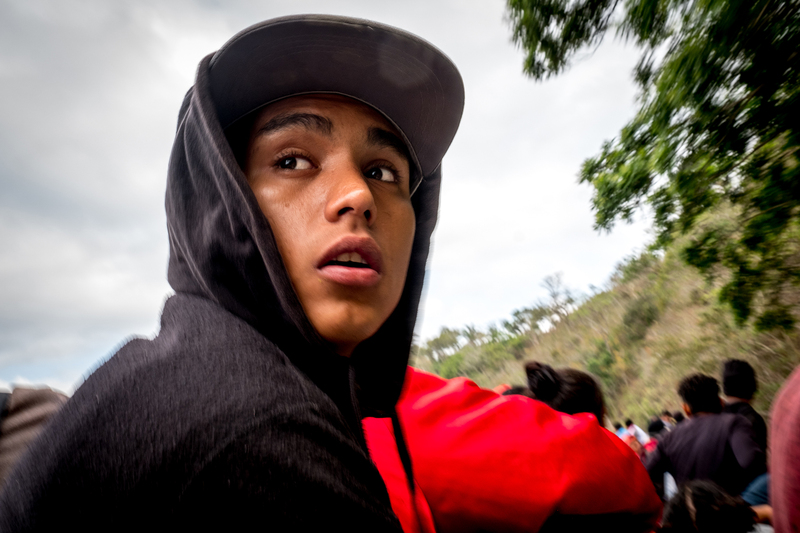 When I look back on this leg of the trip, my own feelings were best captured in a portrait I took of a young Honduran — in his mixed expression of both fear and excitement I see myself. 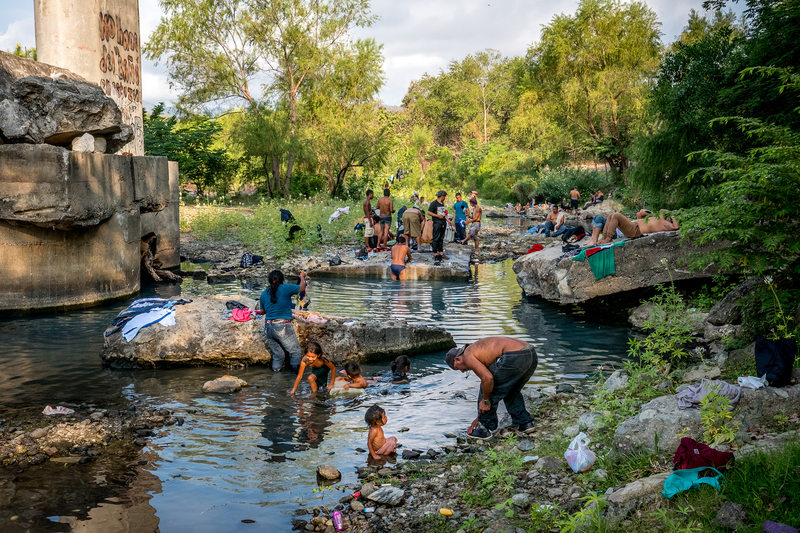 Members of the caravan bathe and wash their clothes in a river in San Pedro Tapanatepec, Oaxaca. Members of the caravan ride La Bestia, the infamous cargo train that carries them north through Mexico, through Veracruz. The journey by train is riddled with dangers from low-hanging tree branches to armed gangs that prey on the vulnerable travelers. An image I like a lot is of a boy looking out of a bus window as we drove into Mexico City. This is the biggest city that this kid has ever seen, and this is when the media attention started to get most intense. To me, it speaks to the beginning of the second phase of the caravan as an international story, and nothing was going to be the same after this point. In terms of access, we had a major advantage because most of the press would show up at convenient times — people didn't stay out at night very often because it was quite dangerous. So there would be these huge press packs in the middle of the day, but then at night when everyone was camping alongside the train tracks, very little media was there. Another picture I like a lot is from Tijuana — this woman and her husband got married that day before crossing the border. The wedding ended up being a bit of a circus because of the 20 TV cameras that turned up, but this picture before the press arrived is a wonderful, quiet moment. To me it has an aspect of hopefulness of it. What’s coming was probably going to be really rough for them — they were probably going to go to detention and be separated from each other, but maybe their kid would grow up and have a better life. By the time we got to Tijuana, there were so many people there that the caravan didn't look like it had when it started. 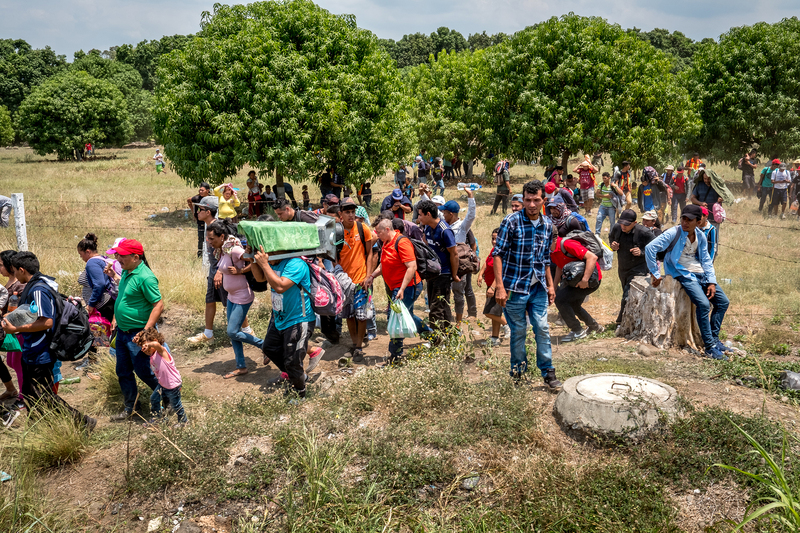 Lots of migrants from all over Mexico had joined and there was a huge turnover: Some people had branched off, some people had stayed in Mexico, some people had gone their own way, and some people had gone off to try and sneak across the border illegally. There were tons of media, tons of activists, and tons of people who had just joined in, hoping that it would make it easier to get into the United States. The group dynamic was also different. When we started and were walking down the highways spending hours and hours with people, we formed strong bonds with them. But when the rest of the media came, the whole thing shifted and became much more impersonal and predatory. The migrants were much more hesitant to talk and it was harder to form real connections. 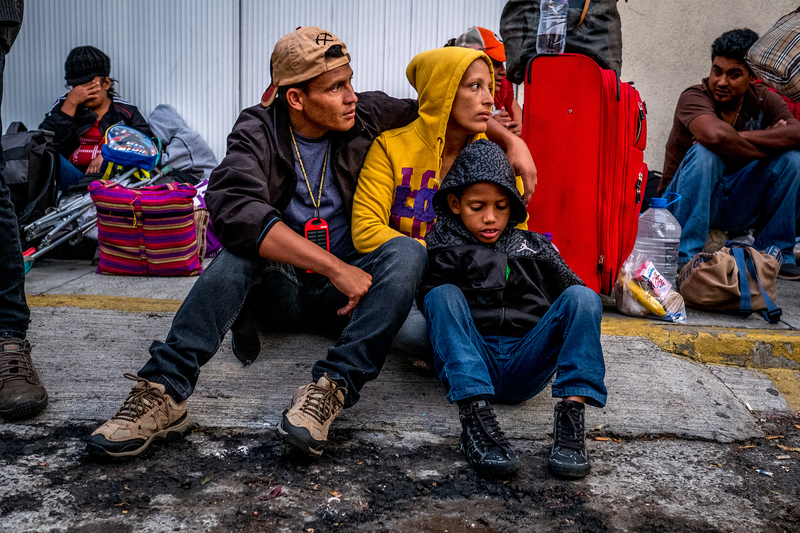 A family waits for their turn to board a bus from Puebla to Mexico City. A mother and baby are filmed by a TV crew in Matías Romero, Oaxaca. After President Trump began demanding via social media that the caravan is stopped, international media attention on the group greatly intensified. 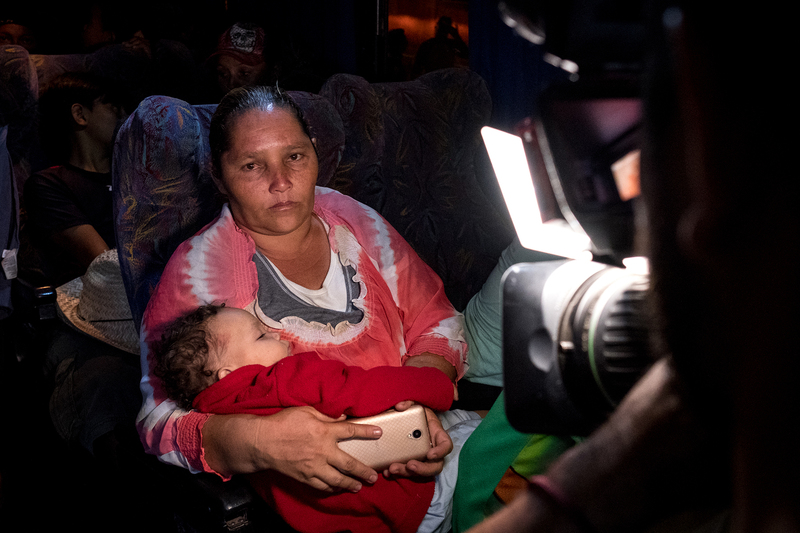 How did the members of the caravan view you being there as journalists? In terms of access, it was a dream because we were the only journalists that were there from the beginning. This gave us something of a favored status and a level of access that I don’t think most of the press corps had. What worried us the most was privacy and that the migrants didn’t understand how the media worked. In the end the story was so highly publicized that their names and faces were everywhere, but in the beginning we were hesitant to publish this information in case it was used against them during their asylum cases. We know that what goes on the internet is very hard to take down, and we wanted to be sure people who trusted us weren’t sharing stories without understanding that they would be online forever. A photographer runs out of the sightline of the assembled press awaiting the arrival of the caravan and the Basilica of Guadalupe. 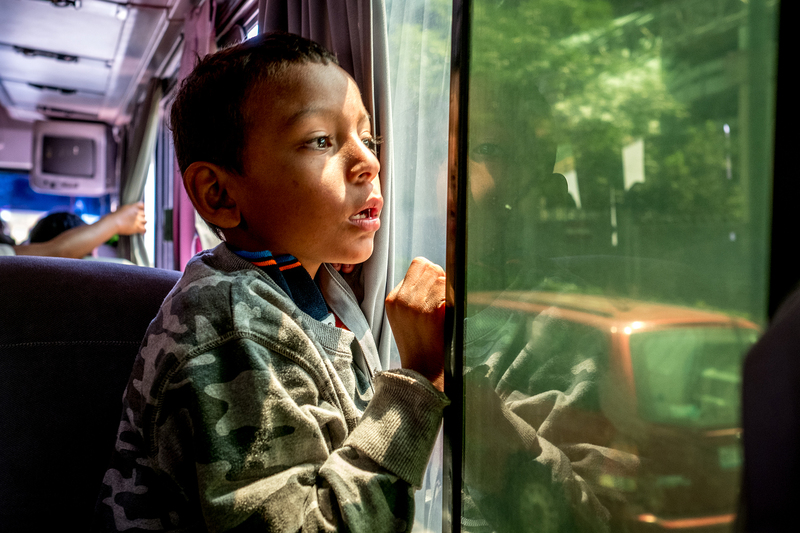 A boy looks out the window of the bus as the caravan enters Mexico City. The sprawling Mexican capital has a higher population than both Hondurans and El Salvador combined, and for many migrants it is the biggest city they've ever seen. 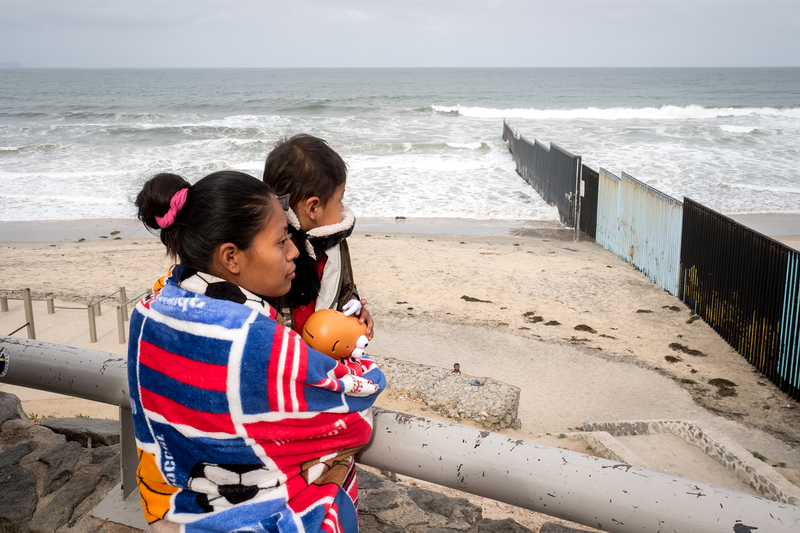 Mirna Lastenia Aldana Díaz and her son Joshua look at the US–Mexico border wall in Tijuana. A large crowd gathered on the Tijuana side of the border wall to cheer on the caravan as they prepare to formally request asylum.